The HOLIDAY SPECTACULAR is BACK ! ! !! ! We're so EXCITED ! ! ! BY CLICKING THE HO-HO-CELLO ABOVE! And, looking for that perfect gift for under the tree? Shop our sweet STORE for the Holidays! at Rockwood Music Hall, Stage 2! HOLY DECEMBER WE MADE OUR KICKSTARTER GOAL!!! THANKS TO YOU!!! We are still in shock as last Friday, December 6th...our Kickstarter campaign for our sophomore album, "Petits Bisous" came to successful completion. Therefore, our sincerest gratitude goes to our INCREDIBLE BACKERS ! ! ! THANK YOU! THANK YOU! MERCI BEACOUP! MERCI BEAUCOUP! ! ! BISOU, BISOU, BISOU! ! ! 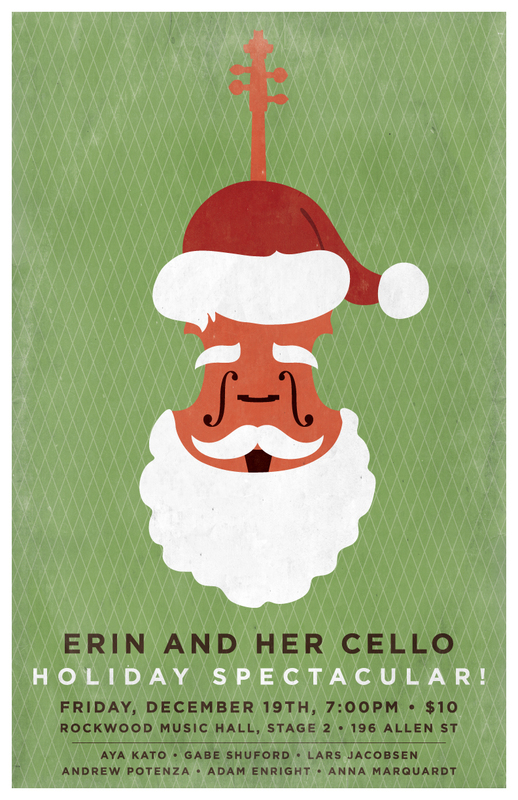 THE ERIN AND HER CELLO HOLIDAY SPECTACULAR IS ONE WEEK FROM TONIGHT! Holiday Hijinks! ! ! Santa Sensations! ! ! December Dreams !!! We can't wait to see you and share our holiday music with you! ! !